September 20th I'll be presenting a Myofascial Therapy workshop with Lucy White Ferguson, DC, and Ben Daitz, MD, at the 27th Annual Meeting of the American Academy of Pain Management (AAPM). The AAPM Annual Clinical Meeting is dedicated to integrative pain management and designed for all members of the integrative pain care team. 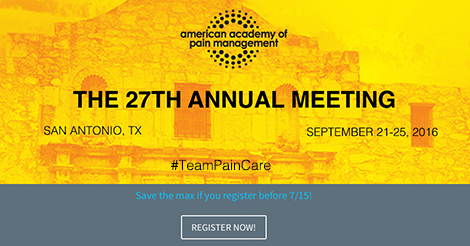 Over a thousand professionals in the field will be sharing expertise, new skills, and the latest techniques in pain management. We are launching our own MyoRehab YouTube channel! Curated videos by Victoria L Magown will offer interesting lectures and demonstrations for patients, students, and practitioners of Myofascial Realignment Therapy. Eventually I will be providing full online webinars as well. I am very excited about this new development for MyoRehab. Now it is official, I am a Fascial Manipulation Therapist! I just returned from Scottsdale, Arizona, for the second time in a month. I attended the Fascial Manipulation Seminar Part 2, A & B, three days each, led by Warren Hammer, DC, MS, and Stefano Casadei, PT. On Sunday, we had a graduation ceremony with cake and champagne. I attended Part 1, A & B in March and April, 2011 in Las Vegas, Nevada, and have been treating patients’ Fascia since then using all that I learned. Stay up-to-date with this UNM Continuing Medical Education Advanced Myofascial Seminar, January 29–31, 2016, at the Albuquerque Sheraton Uptown Hotel. I will be presenting an hour lunch lecture on Perpetuating Factors on Saturday, and another on Fascial Dysfunction on Sunday. 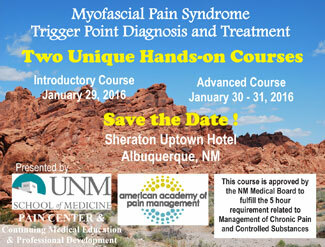 For more information and to register online, visit UNM Continuing Medical Education. Looking forward to seeing you there.